What is a Braille Trail? Braille trails and sensory gardens are a step toward increased accessibility for the visually and otherwise physically impaired. The United Nations (UN), an international organization which takes action on issues confronting humanity in the 21st century, has developed a set of global goals for sustainability to be reached by the year 2030. One of these Sustainable Goals is Reduced Inequalities (SDG 10), which can be addressed by providing access to the outdoors for the visually impaired and others with physical disabilities by creating places and opportunities for them to safely experience the outside world. Another UN Goal is Sustainable Cities and Communities (SDG 11), which these trails and gardens can provide by encouraging communities to conserve natural areas and include inclusive green spaces in their development goals. Braille trails and sensory gardens help satisfy both provisions by promoting universal access to safe, inclusive and accessible green and public spaces, particularly among populations such as persons with disabilities. What can be done to help the visually impaired and others with disabilities experience the outdoors? 1. Build a new Braille trail or sensory garden. Often Braille signs and guides can be added to existing trails and gardens to make them accessible. For information on how to get started, please fill out the contact form for a guide to creating a Braille nature trail and available resources. 2. 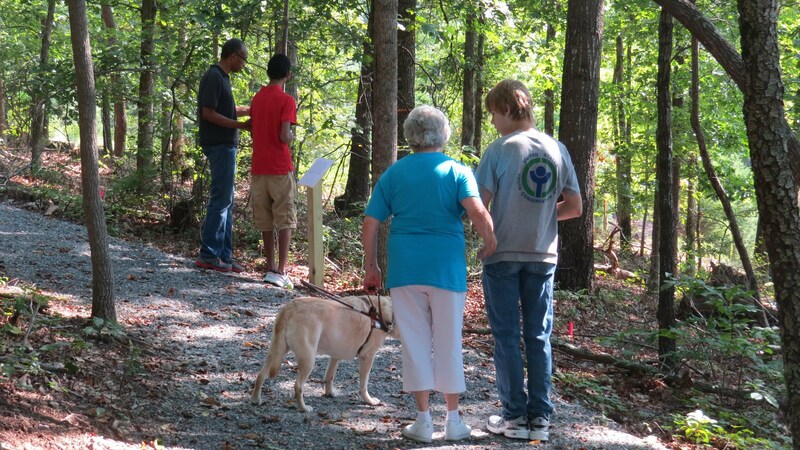 Lead a nature walk for the visually impaired along a trail or through a sensory garden. Contact a local organization or school that serves the blind to arrange a group visit. If possible provide one volunteer per visually impaired participant to join them and enjoy the experience together. 3. Create an outdoor event for the visually impaired for Global Youth Service Day. Global Youth Service Day (GYSD) is the world’s largest community service event in the world, and is held every spring in communities all over the world. For ideas on how to create a GYSD event in your community, visit Youth Service America’s website at http://ysa.org/act/programs/gysd/ and check out previous GYSD projects building Braille trails and conducting nature walks at https://www.21stcenturyleaders.org/global-youth-service-day-2016/ and http://www.braillenaturetrail.com/global-youth-service-day.html.